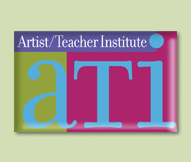 The Artist/Teacher Institute (aTi), 37-year old professional development program for educators and artists in the performing, visual, literary and technology arts, is moving its southern New Jersey site to The Richard Stockton College of New Jersey in Galloway, NJ in cooperation with the Southern Regional Institute and Educational Technology Training Center, and the School of Arts and Humanities. The move represents both a new beginning, as well as a homecoming — the venerable summer arts program that has reached more than 50,000 teachers, began in 1975 and was at Stockton State College as a residential program in the 1990s. Today, aTi continues to enable New Jersey teachers to take a variety of hands-on arts workshops and then apply their newfound knowledge and enthusiasm back in their own classrooms to impact students. 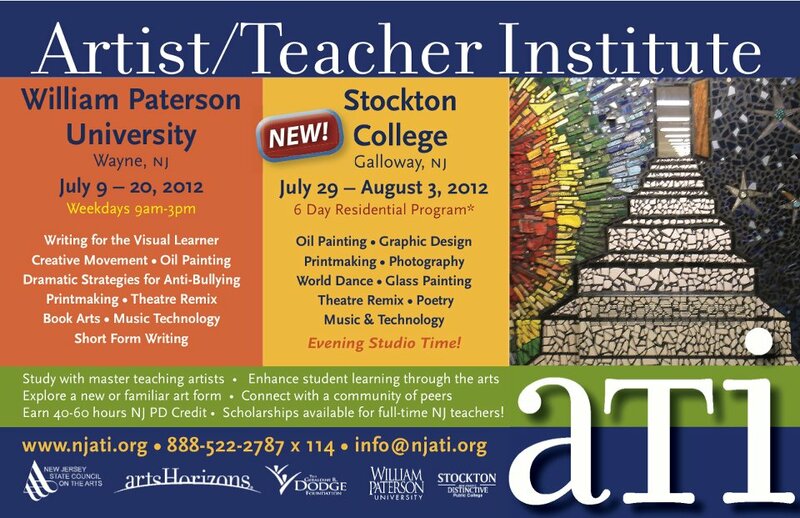 Participants at aTi-Stockton, which begins Sunday, July 29 and runs through Friday, August 3, 2012, select one workshop for an intensive arts immersion experience with a master teaching artist while earning up to 40 hours of NJ Professional Development Credits. In addition to hands-on learning, aTi-Stockton provides evening studio time, opportunities for peer sharing, and optional lodging and meals.